$10 – Adults | $8 – Kids 6 to 17 | Kids 5 and Under – FREE – Register in the box below. $30 – Register in the box below. 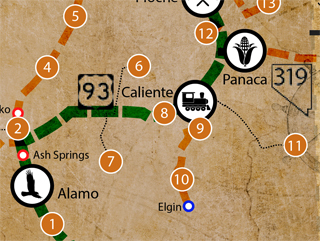 Enter the Alamo Shootout Drone Races and compete for prizes, including $2,500 in cash! 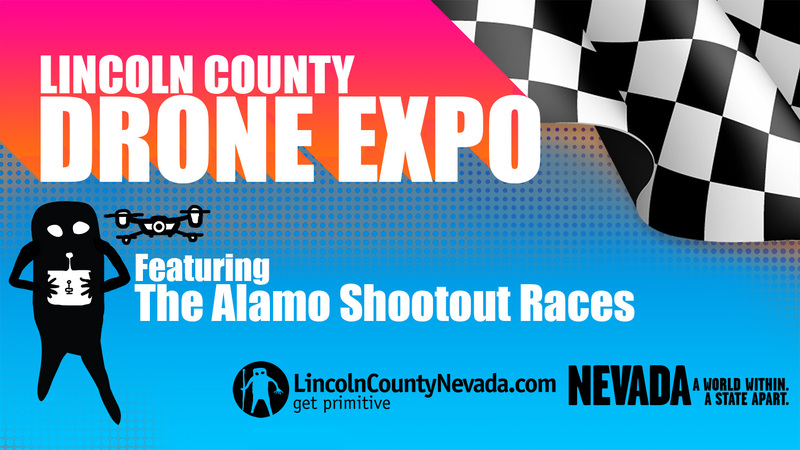 Come to Alamo, Nevada for the inaugural Lincoln County Drone Expo, featuring the Alamo Shootout Drone Races. The event begins Friday, May 18th at 9 a.m. and runs through Saturday evening. 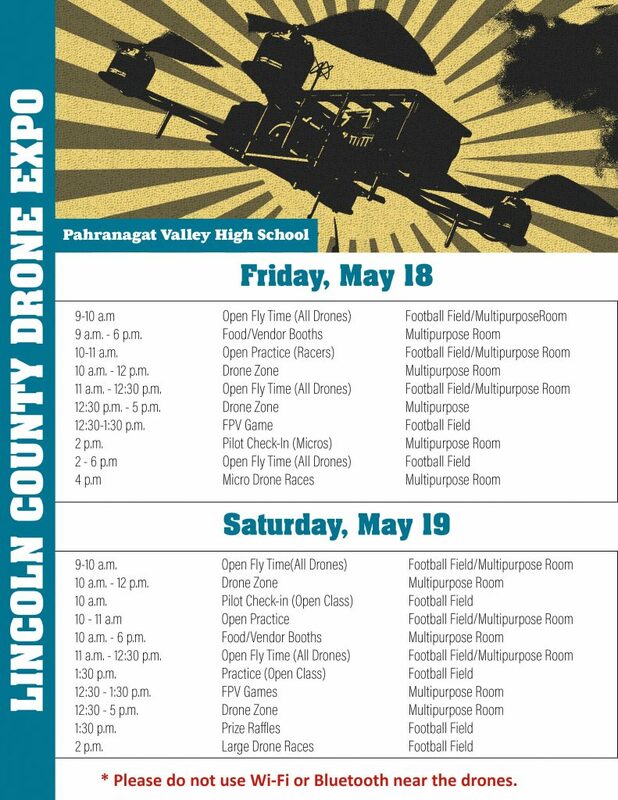 Organized by the Las Vegas Drone & FPV club, it will be two great days of high-flying fun in the beautiful Pahranagat Valley, just 90 miles north of Las Vegas. The event will be held at Pahranagat Valley High School and will include various attractions. Check out exhibits. Learn how to fly drones in the Drone Zone. And take part in the Alamo Shootout held at the Panther Alumni Stadium, where racers will compete for various prizes, including $2,500 in cash. 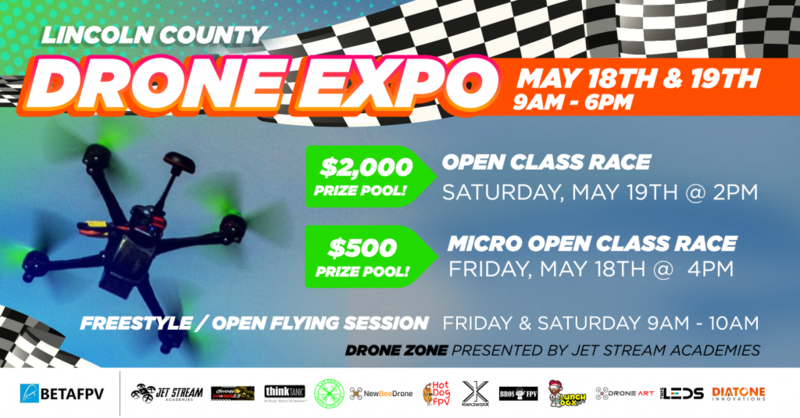 A ticket to the Drone Zone also enters you into a raffle to win a drone! While you’re here, enjoy the various outdoor attractions the valley has to offer – the Pahranagat National Wildlife Refuge, nearby ancient rock art sites, and plenty of wilderness to explore. Open Practice – Friday, 10 a.m. to 6 p.m. Pilot Check-In Begins Saturday at 10 a.m.
Race Starts Saturday at 2 p.m.
Open Practice/Pilot Check-In Begins Friday at 10 a.m.
Race Starts Friday at 4 p.m.
Friday & Saturday – 9 a.m. to 10 a.m. Check in will be at the high school main entrance. Use the links on the menu above to learn all there is to see and do in Lincoln County! Special thanks to our Gold level sponsor BETAFPV for stepping up in a big way.